Qigong is the treasure of the Chinese culture, it contains their ancestors for thousands of years of life from the practice to observe that the true meaning of human life and the illnesses and health. Qigong in order to have the ancient word, but not widely used. The early fifties the twentieth century, advocated by Mr. Liu Guizhen, began to prevail. Taoist alchemy, Confucian meditation, the guide physicians, Buddhist meditation, martial arts, Zhan Zhuang, although not called qigong, but are considered the scope of qigong. Is actually the modern popular qigong derived from five branches, extracted. The purpose of Qigong practice can be divided into two levels, the highest level is the repair great wisdom, great feel Dawu, do welfare of mankind to realize the value of life. The lowest level is the health of disease-free, peaceful and work hard to the music off. About Qigong fixed fork, and now there is no standardized definition of benevolent see benevolence and the wise see wisdom, combination of all claims, can be expressed as: Qigong is through the people's consciousness of the use and transfer "body, mind, interest rates, "and practice "Fine, gas, god, type ", is the optimization of human life in a state of active self-training methods. 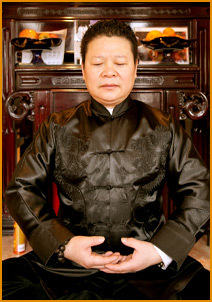 Which contains three meanings, the first is the method, the main body awareness through the use of, and tone the body, mind, and interest rates, and training, fine, gas God, shape, and the second aim is to optimize human life activities in State, which is different from the acrobatics qigong, hard qigong watershed. The third approach, which emphasizes self-training. Qigong can be described as science? Qigong is the science view the universe as a whole, the same concept of Heaven and the whole concept of human life and starting to study the movement of persons on life and its inherent natural and social environment relationships and apply these laws and internal relationships through human consciousness, Three guidance, and conservation ethics, sport is from the Yi Shi optimal state of human life and doctrine.